Is there any greater reward than giving back and seeing it inspire others to push forward? At RTC, there is little that can compare to uniting and empowering world changers; crusaders in the fight for human connection and love. Here is a letter written to author Alesia Shute by a woman who has spent much of her life giving back, and is currently making the push to do so on a grander scale. Let's root her on! Alesia Shute, a cancer surivivor since the age of 7, came across the most stunning portrayal of joy and strength. Watch the video and read her words of understanging and grace. Knowing Alesia and watching this video, was a one two punch for me. I'm not a cryer, but boy, this was beautiful and got me good. 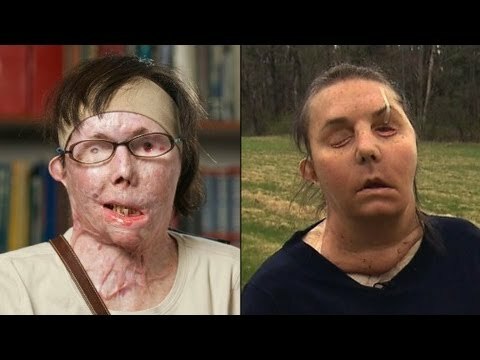 On May 1st, 2013, Carmen Tarleton gave CNN an exclusive first look at the results of her face transplant. We share this today, because today, months later, Carmen's story is being featured on Katie Couric's show. Take a moment to remind yourself of Carmen's journey and the power of forgiveness and courage. Alesia Shute was diagnosed with cancer at the age of 7. Her long battle and the strain it put on her family created an advocate out of Alesia. Today she spends much of her time visting families struggling through catastrophic childhood illness. Here she shares what she has learned about the power of touch. On October 26th, 2013, Carmen Tarleton's story was featured on the front page of the New York Times. This stunning video played on the online version of the article. On May 1st of 2013, the RTC team travelled to Boston to witness the historic press conference where author Carmen Tarleton revealed her new face. RTC's Katie Gutierrez captured the experience in this stunning piece that honors the donor's daughter and the moments where she shared her mother's beauty and spirit.